Rosie Radiator is the creator of Loose Ankle Tap® also known as RadTap™. Rosie's national solo TV commercials, Guinness World Records and Radiators night club trio, have made her the subject of numerous national and international news stories. The Smithsonian Magazine calls Rosie "San Francisco's tap dance guru." and Senator Dianne Feinstine says "There goes the true spirit of San Francisco." 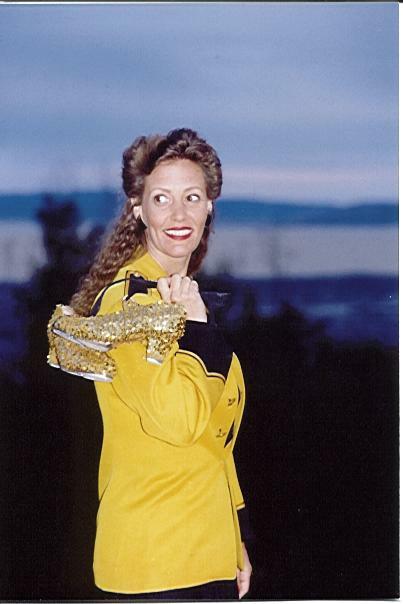 Since her historic dance across the Golden Gate Bridge on Labor Day 1976 proclaiming the first Tap Dance Day, Rosie and her Rad Tap Teams have set numerous Guinness World Records and are the current record holders for long distance unison tap dancing. Xtremetap™ at the Royce Gallery is Rosie's latest tap fantasy dream come true and she invites everyone to join in the fun. Rosie's tap dance adventures and pioneering discoveries have changed the world of tap forever. Freedom of mind-freedom of movement. Loose Ankle Tap® is a state of mind with the clear tap technique to support it. The Loose Ankle Tap technique is an understanding of how the tap dancer operates as a natural moving musician. Clients who use Loose Ankle Tap technique look effortless and natural as they dance and tap teachers love this clear teachable tap technique. Loose Ankle Tap dancers are musicians with our full weight on the instrument. We do not dance to music … we make music. Tappers who do not live in the bay area and cannot attend ongoing Loose Ankle Tap® Classes attend the occasional Loose Ankle Tap®Workshops for 5 days of deep immersion Rad Tap training. Soundancing Inc., established in 1990, is a non profit corporation that promotes sound producing dancers. Sound producing dancers share special needs for acoustics, shoes, floors, sightlines,electronics and music. We strive to inform and consult with presenters and others who need to know how best to teach and present sound producing dance.